This hotel is 100 pct non-smoking. The Homewood Suites by Hilton Falls Church I-495 at Rt. 50 hotel is 9 miles from Washington DC and is in the heart of the Northern Virginia business and technology corridor with easy access to all major highways. The Homewood Suites Falls Church Washington DC Virginia hotel features many amenities including complimentary high-speed internet access an indoor pool/spa and complimentary passes to the local Gold*s Gym. The Homewood Suites hotel in Falls Church Virginia offers complimentary transportation to the nearby Dunn Loring Metro Station as well as local business and restaurants that are within a five mile radius. 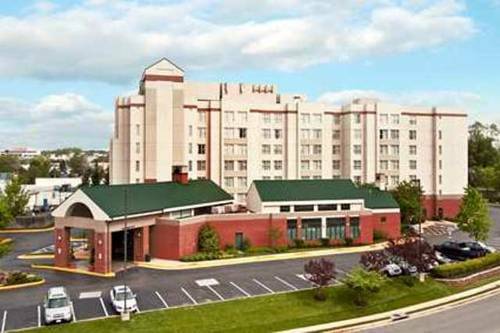 The Homewood Suites near Washington DC is the perfect address for both business and family visits. We are also a pet friendly hotel /be sure to check out the specific details when traveling with your pet/. Make Yourself At Home. All reservations must be guaranteed with a major credit card or adv cash deposit to hotel regardless of time of arrival. All reservations must be cancelled by 6pm host time unless deposit required. Policy subject to change. All reservations must be cancelled by 11:59 PM the night before arrival host time unless deposit req. If this reservation has been made electronically please cancel it electronically to avoid confusion and a no-show bill. Policy subject to change. - Dunn Loring Metrorall Stat. ~10 miles from Falls Church.